I just love these stamps from Paper Jewels - they are so adorable! This is my first card as a design team member for them. You can check out the other great team creations on the Paper Jewels blog. She is Mimosa Heart in a Box and I couldn't resist using these bright and cheery colors for her. I used the Sweet Stop SSS41 for the sketch. 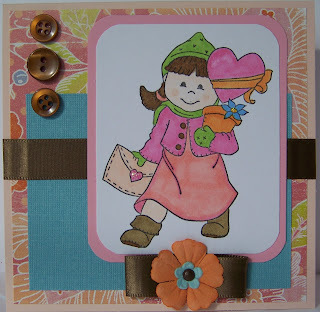 Other materials are SU cardstock in blush blossom and pretty in pink. Other papers are misc from my stash. Buttons are Papertrey Ink. Clear stickles, misc ribbon and other embellies. Image is Bildmalarna colored in with Copics and Bic Mark Its. Love it!!!! Just a perfect card all around. Love the bright cheery colours! This is so cute.....I love the ribbon and flower!